Frank Sinatra is one of the most popular singers in American history. As an actor, he appeared in fifty-eight films and won an Academy Award for his role in From Here to Eternity. His career started in the 1930s and continued into the 1990s. Francis Albert Sinatra was born in Hoboken, New Jersey, on December 12, 1915, the only child of Italian immigrants Martin and Natalie "Dolly" Sinatra. His father was a fire-fighter for the city of Hoboken and his mother was an amateur singer who often sang at social events. Sinatra lived in a mainly Italian American working-class neighborhood. His first experience with music came when his uncle gave him a ukulele, and on hot summer nights he loved to go outside and sing while playing the instrument. His other interest was boxing. To protect himself in the tough neighborhood he grew up in, he became a competent boxer. In high school he was a generous but pugnacious (likely to fight) individual—the traits he would carry with him throughout his life. big break on the radio talent show Major Bowes and his Amateur Hour in 1935, singing in a group called the Hoboken Four. At this time Sinatra sang in various New Jersey nightclubs, hoping to attract the attention of "Swing Era" bandleaders. In 1939, he began working on radio station WNEW in New York City with bandleader Harry James for $75 per week. That same year he married his longtime sweetheart, Nancy Barbato. They would eventually have three children. After seven months with Harry James, Sinatra joined Tommy Dorsey and his orchestra, causing his career to skyrocket. Dorsey's orchestra was one of the most popular in the land, and it remained so with Sinatra singing with it from 1940 through 1942. During that time, Sinatra performed with the band in his first two movies— Las Vegas Nights (1941) and Ship Ahoy (1942). He began his solo career at the end of 1942 and continued his meteoric (speedy and brilliant) rise. The Swing Era lasted from 1935 through the end of World War II (1939–45; a war fought between the Axis Powers—Italy, Japan, and Germany—and the Allies—France, Great Britain, the Soviet Union, and the United States). Sinatra was by far the Swing Era's best-known vocalist. His musical roots combined Tin Pan Alley (the song writing center of New York City) and Italian opera. Most important to him throughout his career would be his insistence on his own style and arrangements for whatever music he sang, thus producing his own unique phrasing of lyrics and melody lines. Though Sinatra was exempted from military service in World War II because of a damaged eardrum, he helped the war effort with his appearances in movies and benefits for soldiers. He was also an outspoken supporter of Franklin D. Roosevelt (1882–1945) and liberal viewpoints, including racial and religious tolerance. He made many appearances to support charities. Sinatra's wide-shouldered suits and his bow ties were imitated by many men, but his most ardent followers were teenaged girls, nicknamed "bobby-soxers" for the ankle-high socks they wore. His widespread appeal was further fueled by America's explosive mass media growth in newspapers, magazines, films, record players, and radio stations. Sinatra was the first singer to attract the kind of near hysteria that would later accompany live appearances by Elvis Presley (1935– 1977) and the Beatles. This type of excitement reached its peak in the Columbus Day riot of October 12, 1944. Thousands of his fans (mostly female) were denied entry into the already-packed Paramount Theater in New York City. They stormed the streets and vented their frustration by smashing nearby shop windows. There were rumors that Sinatra was connected to the Mafia (organized crime). These stories arose mostly from his socializing with alleged Mafia kingpins (chiefs). He also received bad publicity about his noted bar-room brawls (fights) with customers and reporters. The allegations of underworld activity were never proven, and no criminal charges were ever made. In 1954 Sinatra appeared in the critically acclaimed film From Here to Eternity (1954). The role won him an Academy Award for best supporting actor. He appeared in nine films in just two years, including Guys and Dolls (1955), Young At Heart (1955), The Tender Trap (1955), The Man With the Golden Arm (1955), and High Society (1956). Sinatra was back on the record charts as well with "Young at Heart." Nelson Riddle became his musical arranger in the 1950s, and he helped Sinatra stay on the record charts throughout the rest of the decade. (In fact, Sinatra stayed on the charts steadily through 1967, in spite of rock and roll.) Sinatra did not just record singles. He recorded albums around a central theme with a large collection of songs or ballads. From 1957 through 1966 he had twenty-seven Top Ten albums without producing one Top Ten single. Sinatra's bobby-soxer fans were now adults and Sinatra had shifted smoothly to the role of the aging romantic bachelor. This was signified by the image of him leaning alone against a lamppost with a raincoat slung over one shoulder. 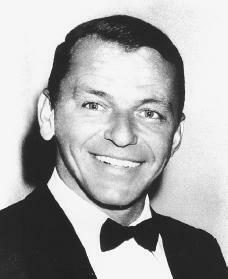 Sinatra's hits in the 1960s included "It Was a Very Good Year" and "Strangers in the Night" (1966). He reached the top of the singles charts in a duet, "Somethin' Stupid," with his daughter Nancy in 1967. Sinatra continued to act in several movies in the 1960s, including Ocean's 11 (1960), The Manchurian Candidate (1962), Robin and the Seven Hoods (1964), and Tony Rome (1967). Many critics felt several of these films had declined in artistic merit. Sinatra became known as part of a group of friends called the "Rat Pack." It included entertainers Dean Martin (1917–1995), Sammy Davis Jr. (1925–1990), Joey Bishop, and Peter Lawford. After Sinatra's famous recording of "My Way" (1969), he made an ill-fated attempt to sing some of the lighter tunes of modern rock composers. This led to a brief retirement from entertainment (1971 through 1973). At this time he also shifted his politics from liberal to conservative. He had become a close friend of Ronald Reagan (1911–), helping him in his later successful presidential campaigns. Sinatra's financial empire produced millions of dollars in earnings from investments in films, records, gambling casinos, real estate, missile parts, and general aviation. He came out of his retirement in 1974 with a renewed interest in older tunes. His return to the limelight was highlighted by his famous recording of "New York, New York" (1980) as he entered his sixth decade of entertaining. In 1988 Sinatra, Sammy Davis Jr., and Dean Martin embarked on a cross-country tour. The tour lasted only one week. Sinatra later organized another reunion tour with Shirley MacLaine (1934–) in 1992 and it was an undeniable success. By 1994 Sinatra was experiencing memory lapses, but that did not keep him from performing publicly. He merely added the use of a prompter (device that shows the words of a song) to remind him of the lyrics. After celebrating his eightieth birthday at a public tribute, new packages of recordings were released and became instant best-sellers. But Sinatra's health continued to deteriorate in the 1990s. On the evening of May 14, 1998, Sinatra died of a heart attack in Los Angeles, California. The audiences who grew up with him and his music were complemented by adoration from younger generations. They have all made "Old Blue Eyes" one of the most outstanding popular singers of the twentieth century. Friedwald, Will. Sinatra! The Song is You: A Singer's Art. New York: Scribner, 1995. Kelley, Kitty. His Way: The Unauthorized Biography of Frank Sinatra. New York: Bantam Books, 1986. Morley, Sheridan. Frank Sinatra: A Celebration. New York: Applause, 1998. Rockwell, John. Sinatra: An American Classic. New York: Random House, 1984. Wilson, Earl. Sinatra: An Unauthorized Biography. New York: Macmillan, 1976. Looking for info, FS apperance/concert at Chevalier Auditorium, Medford Massachusetts, ca. 1940's. Any info helpfull, my history of Chevalier. Thanks Jesse.